KSP is a game I've been playing lately. It takes place on the fictional planet of Kerbal inhabited by creatures that kinda look like the minions from Despicable Me. You're in charge of their space program and are tasked with designing rockets and launching them into orbit. I've only tried the free demo so far which only lets you design and launch rockets and removes all planets and moons from the game apart from the home planet and its own moon, but even with that I've found it hugely addicting. It's complicated as all get out, but I recommend that you guys at least try the demo. It's quite fun. One of the loops in MLP Loops is a crossover with Kerbal Space Program. In it, it was claimed that an empty fuel tank can explode and launch a kerbal into orbit by accident. I know engines can explode if they overheat or if the structure of the ship is poorly designed. If it is true, it hasn't happened to me yet. Empty fuel tanks add too much mass, so I always have my ships designed to jettison them once they go empty. Looked super cute. If it's actually got some decent gameplay I might just play it with the Baconatrix. or if the structure of the ship is poorly designed. Number 1: there is no way to plant the flag in demo mode, right? Number 2: Any crazy-enough-to-work idea of how to get rid of orbiting debris? Not that I'm aware of. I've not yet tried landing a ship on Mun because I don't believe I'd be able to do it without crashing my ship and killing the poor Kerbal. I've considered simply plotting a collision course and explode them out of the sky. Other than that I don't think so. I know you can dock in the full version, so maybe you can pull pieces out of orbit that way? To remove pieces of previous flights in the demo, go to the tracking station (radar dish thing in the overview) and select a flight. You'll have an option to abort the flight. Doing so removes all its pieces from existence. I'm having a blast with the demo. My six-year-old son loves watching me play KSP and likes to help design rockets. The other day we successfully (and accidentally) escaped Kerbin's gravity well, ending up in endless orbit around the sun. I need to practice getting into a proper orbit around Kerbin before trying a "munshot." Best $16.99 i've ever spent. I've been heavily playing KSP and it's freaking addicting. The MechJeb addon takes a lot of the math out of it and helps plan maneuvers and such. Still developing a rocket that doesn't litter the orbit with various empty stages, but I'm almost there. Project django (basically a flying revolver using solid boosts as amno, used to blast debris) was dropped due to "too much fuel to get the ugly thing in orbit"
the previous picture is Project Phoenix. It went up initially in about 8 stages. The drive section got redesigned from it's old configuration to a radial configuration because when i fired the separators covering the core nuke engines the assembly ate itself. It's completely modular. The cupola and science section went up first, with the docking rings following shortly behind. The Living quarters were added because the parasites were really cramped up into the fuel tanks. 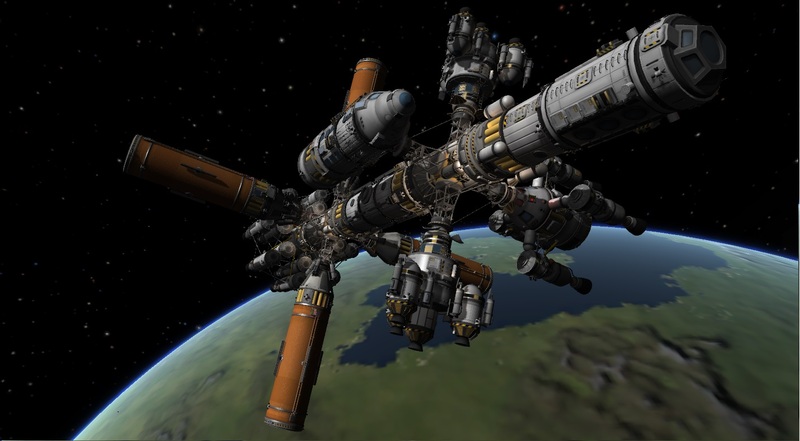 The primary Docking ring has the two science landers, a Tug to maneuver resupply tankers into place, and the atmospheric return vessel. The drive section pictured here has another tank beyond the drive and is a cluster of 24 Nuke engines. In this configuration it went from LKO to Geosynchronous under its own power and only used up about 20% of its on board fuel. Learning from the Phoenix I redesigned a new cruiser called the Independence. The phoenix proved to be far too long to maintain stability over long distances. So, Phoenix Station was born. A refueling and science depository stopover for other interplanetary craft. I also ejected the forward Docking ring to reduce the complexity count. The other thing that caused me to scrap this is that Nuclear power is a LOT more efficient and drops the parts count drastically. With all the Solar arrays open, the Phoenix was almost 2Gb of data. It was a noticeable lag whenever any craft came within 2Km.